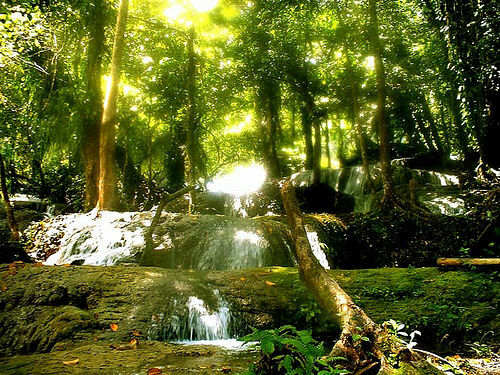 Located in the middle of the forest, Aliwagwag Falls is considered as one of the most beautiful waterfalls in the country. It is a series of 84 falls appearing like stairway to heaven with various heights among the steps ranging from 6 to 110 feet. One step is measured 72 feet and another is 67 feet. Overall Aliwagwag Falls is 1,110 feet of cascading energy and 20 meters in width. All these in the midst of virgin forest. River at the foot of the falls. 13 rapids to cross. Located amidst thick forests just some 25 kilometers away from Cateel proper, Aliwagwag Falls offers adventurers and vacationers alike a wild exposure and relaxing in its refreshing waters will give you an unforgettable and fun experience. Cateel, Davao Oriental is some 360 kilometers from Davao City is accessible by bus at the Ecoland Transport terminal. L300 vans are also available from Davao City. Wow…haven’t been there myself yet!! How does it fair with those in the City of Waterfalls? 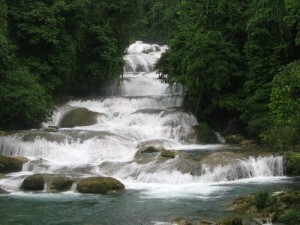 Have you been to the many falls of Iligan City, and its famous Maria Cristina Falls? JessQ, I’m ashamed to admit that I haven’t been to those places in the Philippines yet. I learned about Maria Cristina Falls when I was in high school. I will probably spend time to get around our country sooner or later. I was one of the fortunate ones to have bathed at the lagoons of Aliwagwag. We drove from the old Valderramma Lumbers in Compostela, up Udyongan to Aliwagwag. The drive was scary. The cliffs were harrowing. When we got there, I thought I was in heaven. My brothers and I jumped in the lagoons. There is another lagoon to the right of that picture. At the bottom is the Kateel River. Totally ugly compared to the falls. There are at least two more waterfalls around Compostela. One is the Bango Falls . We bathed there as well. JB, you’re fortunate, indeed! Not many visitors would drive up Compostela to see the falls. But it’s time to go for an adventure trip like you did. Thanks for sharing your experiences on those trips. It was September 27, 2007, when we were able to pass by Aliwagwag Falls. We had just finished a week engagement in the Municipality of Cateel. The Team travelled from Davao City via Mati, Davao Oriental for 3 hours. From Mati, we travelled another 6 hours to reach Cateel. After 6 days, we went back to Davao City, but this time we took another route, through Compostella Valley Province. After one hour of travel, we passed by a bridge and to our amazement, we saw Aliwagwag Water Falls. We all went out of the car, to witness its majestic beauty. Crystal clear waters passed by the rocks which looked like stairs from the mountain top in the middle of the forest. We took a lot of pictures in the bridge, the falls in the background. It was one of my most unforgettable encounter with mother nature, the greatness of God’s creations. Thanks for sharing your unforgettable experience. You’re lucky to have seen Aliwagwag Falls. Amazing, isn’t it? If you have more questions about the aliwagwag Falls, pls. e-mail at iancroatia@yahoo.com. Thank you! …hey yah people,,,thank u for ur comment about our vary own aliwagwag.,..hpe u will visit and place again…but lol brng with u ur friends and fam,,,,and enjoy the sight and hospitality of people liven thr. what a nice place… we’ve there last summer. we traveled almost one day from north Cotabato just to see the place and have adventure… we admired the place..
Hi Shure, I’m glad you like the place. Thank you for sharing your wonderful experience here. I’m sorry ’bout me reply.. It’s not complete, isn’t it??? Aliwagwag Falls is considered by many scientists and engineers as the tallest waterfalls in the Philippines. This wonder is 29 Kilometers away from the capital barangay of Cateel, Barangay Poblacion. Try to visit Tinuy-an Falls in Bislig City, it is the most magnificent falls i’ve ever seen. Wow! I have gone to this place for several times in the year 2000. its really amazing and spectacular, the falls is cascading over 20 steps. The serenity of the place awed me most. Its a good place to escape from the hustle bustle of the city life. This is a God given and hidden treasure of the very warm loving people of Cateel. Hope and pray its still look the same when I first saw it. Its very wonderfull,dapat ang municipality ay pag ingtan ang yaman na ito . i LOVE A L I W A G W A G FALLS!!!!! Paunsa moadto diri gikan Davao City? Palihog panghatag og direksiyon para sab makaadto ko diri 😉 Salamat kaayo! Hi Ma Hou, kung gikan sa Davao mag bus ka padulong Cateel. Unya pag-abot didto, mangutana ka sa taga-didto asa paadto sa Aliwagwag Falls. Ang falls naa sa Barangay Aliwagwag. hello…i just saw a video of aliwagwag falls..maganda! amazing! so how can we get there?bus lng po ba pwedeng sakyan?magkakano po kaya ang gastos? sana po may magreply..gus2 kong pumunta dun…sobra ganda nung falls..
Hi Jeka, bus or drive your car lang ang alam ko kung paano pumunta sa Aliwagwag Falls. As for the fare, it was Peter who wrote this post kaya wala akong maibigay na exact na gastos. Pero hindi naman siguro kamahalan. Ang mga bus nasa Ecoland, you may ask anyone from there. totoo nga pala,,na pa ka ganda ng aliwagwag falls,,,naka pa tindig balahibo sa ganda,,parang virgin forest pa ang paligid ,,ang lamig ng place,,we travel pa for 14 hour’s from cotabato to cateel ,,marami pang mga place na maganda pala sa cateel,,dats our 1st tyme to visit the place,,bawing-bawi ang pagod namin,,,ang saya-saya ng mga kids namin,,,tks cateel.. I can handle the travel and road danger going there but is the security (e.g. NPA, kidnapping, ambush, robbery, etc.) not an issue going there? Yes, Aliwagwag Falls is one of the beautiful sites in the Ph. Gone there and felt the pristine water cascading in a series of boulders. A truly sight to see. Feel the nature at its best. Can we spend overnight at aliwagwag falls area? Is there any inns or hotel where we stay in. I saw the place…its very awesome and we wanted to experience what you have experienced. Are foreigners okay to come? Is the place safe? Im excited to see aliwagwag falls this august,i was amazed when i saw it in the magazine of cebu pacific well in fact my mother in lives there,brillantes family. paano ang patungo sa aliwagwag falls. pwede bang mag-overnight stay doon. Simple accomodations ay okay na basta safe and secure. saw aliwagwag falls after storm pablo, it was still majestic but without the greens around it was like ice cream without cones, but refreshing to see the waters clearly gushing upstream.